Ambrose Powell Hill, Jr. (November 9, 1825 – April 2, 1865) was a Confederate general who was killed in the American Civil War. He is usually referred to as A.P. Hill, to differentiate him from another, unrelated Confederate general, Daniel Harvey Hill. "Little Powell", "A. P. Hill"
A native Virginian, Hill was a career United States Army officer who had fought in the Mexican–American War and Seminole Wars prior to joining the Confederacy. 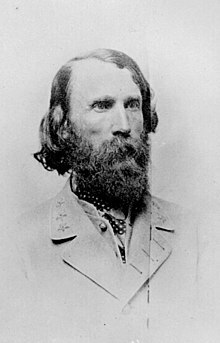 After the start of the American Civil War, he gained early fame as the commander of the "Light Division" in the Seven Days Battles and became one of Stonewall Jackson's ablest subordinates, distinguishing himself in the 1862 battles of Cedar Mountain, Second Bull Run, Antietam, and Fredericksburg. Following Jackson's death in May 1863 at the Battle of Chancellorsville, Hill was promoted to lieutenant general and commanded the Third Corps of Robert E. Lee's Army of Northern Virginia, which he led in the Gettysburg Campaign and the fall campaigns of 1863. His command of the corps in 1864–65 was interrupted on multiple occasions by illness, from which he did not return until just before the end of the war, when he was killed during the Union Army's offensive at the Third Battle of Petersburg. Hill, known to his family as Powell (and to his soldiers as Little Powell), was born in Culpeper, Virginia, the seventh and final child of Thomas and Fannie Russell Baptist Hill. Powell was named for his uncle, Ambrose Powell Hill (1785–1858), who served in both houses of the Virginia legislature, and Capt. Ambrose Powell, an Indian fighter, explorer, sheriff, legislator, and close friend of President James Madison. Hill was nominated to enter the United States Military Academy in 1842, in a class that started with 85 cadets. He made friends easily, including such prominent future generals as Darius N. Couch, George Pickett, Jesse L. Reno, George Stoneman, Truman Seymour, Cadmus M. Wilcox, and George B. McClellan. His future commander, Thomas J. Jackson, was in the same class but the two did not get along. Hill had a higher social status in Virginia and valued having a good time in his off-hours, whereas Jackson scorned levity and practiced his religion more fervently than Hill could tolerate. In 1844, Hill returned from a furlough with a case of gonorrhea, medical complications from which caused him to miss so many classes that he was required to repeat his third year. Reassigned to the class of 1847, he made new friendships in particular with Henry Heth and Ambrose Burnside. Hill continued to suffer from the effects of VD for the rest of his life, being plagued with recurrent prostatitis, which was not treatable before the advent of antibiotics. He may have also suffered urinary incontinence due to inflammation of the prostate pressing on his urethra, which could also lead to uremic poisoning and kidney damage. He graduated in 1847, ranking 15th of 38. He was appointed to the 1st U.S. Artillery as a brevet second lieutenant. He served in a cavalry company during the final months of the Mexican–American War, but fought in no major battles. After some garrison assignments along the Atlantic seaboard, he served in the Seminole Wars, again arriving near the end of the war and fighting various minor skirmishes. He was promoted to first lieutenant in September 1851. From 1855 to 1860, Hill was employed on the United States' coastal survey. He was once engaged to Ellen B. Marcy, the future wife of Hill's West Point roommate George B. McClellan, before her parents pressured her to break off the engagement. Although he felt no ill will about the affair afterward, during the war a rumor spread that Hill always fought harder if he knew McClellan was present with the opposing army, because of Ellen's rejection. On July 18, 1859, he married Kitty ("Dolly") Morgan McClung, a young widow, thus becoming the brother-in-law of future Confederate cavalry generals John Hunt Morgan (Hill's best man at the wedding) and Basil W. Duke. On March 1, 1861, just before the outbreak of the Civil War, Hill resigned his U.S. Army commission. After Virginia seceded, he was appointed colonel of the 13th Virginia Infantry Regiment. The 13th Virginia was one of the regiments in Brig. Gen. Joseph E. Johnston's army that were transported by railroad as reinforcements to the First Battle of Bull Run, but Hill and his men were sent to guard the Confederate right flank near Manassas and saw no action during the battle. Hill was promoted to brigadier general on February 26, 1862, and command of a brigade in the (Confederate) Army of the Potomac. In the Peninsula Campaign of 1862, Hill performed well as a brigade commander at the Battle of Williamsburg, where his brigade blunted a Union attack, and was promoted to major general and division command on May 26. Hill's new division was composed mainly of brigades pulled from the Carolinas and Georgia. His division did not participate in the Battle of Seven Pines (May 31 – June 1), the battle in which Joseph E. Johnston was wounded and replaced in command of the Army of Northern Virginia by Robert E. Lee. June 1 was the first day that Hill began using a nickname for his division: the Light Division. This contradictory name for the largest division in all of the Confederate armies may have been selected because Hill wished his men to have a reputation for speed and agility. One of Hill's soldiers wrote after the war, "The name was applicable, for we often marched without coats, blankets, knapsacks, or any other burdens except our arms and haversacks, which were never heavy and sometimes empty." Hill's rookie division was in the thick of the fighting during the Seven Days Battles, being heavily engaged at Mechanicsville, Gaines Mill, and Glendale. Following the campaign, Hill became involved in a dispute with James Longstreet over a series of newspaper articles that appeared in the Richmond Examiner; relations between them deteriorated to the point that Hill was placed under arrest and Hill challenged Longstreet to a duel. Following the Seven Days Battles, Lee reorganized the army into two corps and assigned Hill's division to Stonewall Jackson. Their relationship was less than amicable and the two quarreled many times. Hill frequently found himself under arrest by Jackson. At the Battle of Cedar Mountain on August 9, Hill launched a counterattack that stabilized the Confederate left flank, preventing it from being routed. Three weeks later at the Second Battle of Bull Run (Second Manassas), Hill was placed on the Confederate left along the unfinished railroad cut and held it against repeated Union attacks. During the campaign, Hill became involved in several minor disputes with Jackson concerning Jackson's marching orders to Hill. Hill's performance at The Battle of Antietam was particularly noteworthy. While Lee's army was enduring strong attacks by the Army of the Potomac outside Sharpsburg, Maryland, Hill's Light Division had been left behind to process Union prisoners at Harpers Ferry. Responding to an urgent call for assistance from Lee, Hill marched his men at a grueling pace and reached the battlefield just in time to counterattack a strong forward movement by the corps of Maj. Gen. Ambrose Burnside, which threatened to destroy Lee's right flank. Hill's arrival neutralized the threat, bringing an end to the battle with Lee's army battered but undefeated. Hours after the battle, Hill told an inquisitive major that Burnside owed him $8,000. During the retreat back to Virginia, he had his division push back a few regiments from the Union V Corps. At the Battle of Fredericksburg in December 1862, Hill was positioned near the Confederate right along a ridge; because of some swampy ground along his front, there was a 600-yard gap in Hill's front line, and the nearest brigade behind it was nearly a quarter mile away; the dense vegetation prevented the brigade commander from seeing any Union troops advancing on his position. During the battle, Maj. Gen. George Meade's division routed two of Hill's brigades and part of a third. Hill required the assistance from Maj. Gen. Jubal A. Early's division to repulse the Union attack. Hill's division suffered over 2,000 casualties during the battle, which was nearly two-thirds of the casualties in Jackson's corps; two of his brigade commanders were wounded, one (Maxcy Gregg) mortally. After the battle one of his brigade commanders, Brig. Gen. James J. Archer, criticized him about the gap left in the division's front line, saying that Hill had been warned about it before the battle but had done nothing to correct it. Hill was also absent from his division, and there is no record of where he was during the battle; this led to a rumor spread through the lines that he had been captured during the initial Union assault. Hill and Jackson argued several times during the Northern Virginia Campaign and the 1862 Maryland Campaign. During the invasion of Maryland, Jackson had Hill arrested and after the campaign charged him with eight counts of dereliction of duty. During the lull in campaigning following the Battle of Fredericksburg, Hill repeatedly requested that Lee set up a court of inquiry, but the commanding general did not wish to lose the effective teamwork of his two experienced lieutenants and so refused to approve Hill's request. Their feud was put aside whenever a battle was being fought and then resumed afterward, a practice that lasted until the Battle of Chancellorsville in May 1863. There, Jackson was accidentally wounded by the 18th North Carolina Infantry of Hill's division. Hill briefly took command of the Second Corps and was wounded himself in the calves of his legs. While in the infirmary, he requested that the cavalry commander, J. E. B. Stuart, take his place in command. After Jackson's death from pneumonia, Hill was promoted on May 24, 1863, to lieutenant general (becoming the Army of Northern Virginia's fourth highest-ranking general) and placed in command of the newly created Third Corps of Lee's army, which he led in the Gettysburg Campaign of 1863. One of Hill's divisions, led by his West Point classmate Maj. Gen. Henry Heth, was the first to engage Union troops at the Battle of Gettysburg. 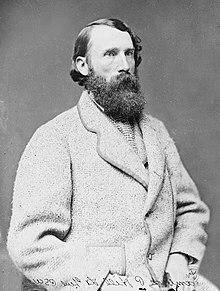 Although the first day of the battle was a resounding Confederate success, Hill received much postbellum criticism from proponents of the Lost Cause movement, suggesting that he had unwisely brought on a general engagement against orders before Lee's army was fully concentrated. His division under Maj. Gen. Richard H. Anderson fought in the unsuccessful second day assaults against Cemetery Ridge, while his favorite division commander, Maj. Gen. William Dorsey Pender, commanding the Light Division, was severely wounded, which prevented that division from cooperating with the assault. On the third day, two thirds of the men in Pickett's Charge were from Hill's corps, but Robert E. Lee chose James Longstreet to be overall commander of the assault. Of all three infantry corps of the Army of Northern Virginia, Hill's suffered the most casualties at Gettysburg, which prompted Lee to order them to lead the retreat back into Virginia. During the autumn campaign of the same year, Hill launched his Corps "too hastily" in the Battle of Bristoe Station and was bloodily repulsed by Maj. Gen. Gouverneur K. Warren's II Corps. Lee did not criticize him for this afterward, but ordered him to detail himself to the dead and wounded after hearing his account. Hill's corps also took part in the Battle of Mine Run. Other than a brief visit to Richmond in January 1864, Hill remained with his corps in its winter encampments near Orange Court House. In the Overland Campaign of 1864, Hill's corps held back multiple Union attacks during the first day of the Battle of the Wilderness, but became severely disorganized as a result. Despite several requests from his division commanders, Hill refused to straighten and strengthen his line during the night, possibly due to Lee's plan to relieve them at daylight. At dawn on the second day of the battle, the Union army launched an attack that briefly drove Hill's corps back, with several units routed, but the First Corps under Longstreet arrived just in time to reinforce him. Hill was medically incapacitated with an unspecified illness at Spotsylvania Court House, so Maj. Gen. Jubal Early temporarily took command of the Third Corps, but Hill was able to hear that his men were doing well and to observe the battle at Lee's side. After recovering and regaining his corps, he was later rebuked by Lee for his piecemeal attacks at the Battle of North Anna. By then, Lee himself was too ill to coordinate his subordinates in springing a planned trap of the Union Army. Hill held the Confederate left flank at Cold Harbor, but two divisions of his corps were used to defend against the main Union attack on the right flank on June 3; when part of the troops to his right gave way, Hill used one brigade to launch a successful counterattack. During the Siege of Petersburg of 1864–65, Hill and his men participated in several battles during the various Union offensives, particularly Jerusalem Plank Road, the Crater, Globe Tavern, Second Reams Station, and Peebles Farm. During the Battle of the Crater, he fought against his West Point classmate Ambrose Burnside, whom the former repulsed at Antietam and Fredericksburg. Hill was ill several times that winter; in March 1865, his health had deteriorated to the point where he had to recuperate in Richmond until April 1, 1865. Hill had said he had no desire to live to see the collapse of the Confederacy, and on April 2, 1865 (during the Union breakthrough in the Third Battle of Petersburg, just seven days before Lee's surrender at Appomattox Court House), he was shot dead by a Union soldier, Corporal John W. Mauck of the 138th Pennsylvania, as he rode to the front of the Petersburg lines, accompanied by one staff officer. The Union soldiers called upon Hill to surrender. He refused their demands and was shot through the chest with a rifle. The bullet went through his heart, came out the other side of his chest, and sliced off his left thumb. Hill fell to the ground and died within moments. His body was recovered by the Confederates shortly afterward. His family had hoped to take Hill to Richmond for burial, but the city's capture by Union forces caused him to be buried in Chesterfield County. In February 1867, his remains were re-interred in Hollywood Cemetery in Richmond. During the late 1880s, several former comrades raised funds for a monument to Hill in Richmond. Hill's remains were transferred to the base of the monument when it was dedicated on May 30, 1892. When Lee heard of Hill's death, he tearfully uttered, "He is now at rest, and we who are left are the ones to suffer." Some analysts consider Hill an example of the Peter principle. Although he was extremely successful commanding his famed "Light Division," he was less effective as a corps commander. Historian Larry Tagg described Hill as "always emotional ... so high strung before battle that he had an increasing tendency to become unwell when the fighting was about to commence." This tendency was to some extent balanced by the implied combative attitude that he displayed. He often donned a red calico hunting shirt when a battle was about to start and the men under his command would pass the word, "Little Powell's got on his battle shirt!" and begin to check their weapons. Wherever the headquarters flag of A.P. Hill floated, whether at the head of a regiment, a brigade, a division, or a corps, in camp or on the battle-field, it floated with a pace and a confidence born of skill, ability and courage, which infused its confidence and courage into the hearts of all who followed it. Hill was affectionate with the rank-and-file soldiers and one officer called him "the most lovable of all Lee's generals." Although it was said that "his manner [was] so courteous as almost to lack decision," his actions were often impetuous, and did not lack decision, but judgment. Nevertheless, Hill was one of the war's most highly regarded generals on either side. When Hill was a major general, Robert E. Lee wrote that he was the best at that grade in the Army. He had a reputation for arriving on battlefields (such as Antietam, Cedar Mountain, and Second Bull Run) just in time to prove decisive. Stonewall Jackson on his deathbed deliriously called for A. P. Hill to "prepare for action"; some histories have recorded that Lee also called for Hill in his final moments ("Tell Hill he must come up. "), although current medical opinion is that Lee was unable to speak during his last illness. In the Hermitage Road Historic District of Richmond, Virginia, the A.P. Hill Monument is located in the center of the intersection of Laburnum Avenue and Hermitage Road. This monument is the only one of its type in Richmond under which the subject individual is actually interred. The United States military honored Hill by naming both a fort and a ship after him. Fort A.P. Hill is located in Caroline County, Virginia, about halfway between Richmond and Washington, D.C.. During World War II, the United States Navy named a Liberty Ship the SS A. P. Hill in his honor. Hill's sword is on display at the Chesterfield County Museum in Chesterfield, Virginia. Hill is depicted in both of Ronald F. Maxwell's Civil War films, Gettysburg (1993) and Gods and Generals (2003). In the former, he was portrayed by historian and Civil War reenactor Patrick Falci; in the latter, by character actor William Sanderson. ^ a b Eicher, p. 296. "Hill, Ambrose Powell" . Encyclopædia Britannica. 13 (11th ed.). 1911. p. 463. ^ Robertson, pp. 30–32; Eicher, p. 296. ^ Robertson, p. 36, lists the appointment as May 9, 1861; Eicher, p. 296, cites May 22. ^ Robertson, pp. 71–98; Hassler, pp. 67–71. ^ Hassler, pp. 74–79, 88–93. ^ Hassler, pp. 73–74, 243–44. ^ Hassler, pp. 112–14, 128–31. ^ Hassler, pp. 75, 95. ^ Hassler, p. 169. The Third Corps suffered 8,982 casualties as opposed to the First's 7,659 and the Second's 6,087. ^ Hassler, pp. 12, 116, 213–39. ^ "Ambrose Powell Hill Biography". Biography. www.civilwarhome.com. Archived from the original on May 13, 2011. Retrieved April 28, 2011. ^ Robertson, p. 69; Tagg, p. 301. ^ Robertson, p. 326; Hassler, p. 242. ^ "The Historical Marker Database". Biography. Bill Coughlin, The Historical Marker Database. Retrieved April 24, 2012. ^ "Fort A. P. Hill home page". Military. United States Army. Archived from the original on April 26, 2012. Retrieved April 30, 2012. ^ "Liberty Ships built by the United States Maritime Commission in World War II". Biography. United States Merchant Marine. Retrieved April 29, 2012. ^ "And Then A.P. Hill Came Up, biography page". Biography. Jen Goellnitz. Archived from the original on 30 August 2010. Retrieved 30 April 2012. ^ "Internet Movie DataBase". Film. Internet Movie DataBase. Retrieved April 30, 2012. Hassler, William W. A.P. Hill: Lee's Forgotten General. Chapel Hill: University of North Carolina Press, 1962. ISBN 978-0-8078-0973-0. Robertson, James I., Jr. General A.P. Hill: The Story of a Confederate Warrior. New York: Vintage Publishing, 1992. ISBN 0-679-73888-6. Pfanz, Harry W. Gettysburg – The First Day. Chapel Hill: University of North Carolina Press, 2001. ISBN 0-8078-2624-3. Wikimedia Commons has media related to Ambrose Powell Hill.